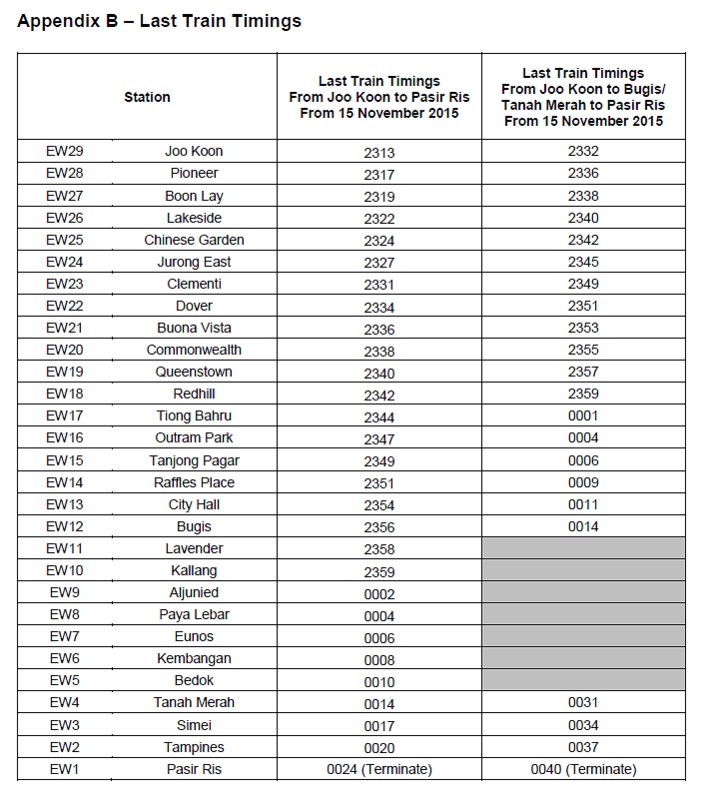 SINGAPORE - Train services from between Bugis and Tanah Merah stations will end half an hour earlier from Sunday to Thursday starting from Nov 15. This early closure of nine stations, which will last till the end of the year, is to accommodate the replacement of sleepers. Sleepers are used to hold the tracks in place. Trains services will run as per normal on Friday and Saturday as well as the eve of public holidays. This is the first phase of the early closure on the East-West Line, where 92,000 timber sleepers will be replaced with concrete sleepers. The second phase, which will affect stations between Joo Koon and Jurong East and between Pasir Ris and Tanah Merah, will start in early 2016, with the final phase affecting stations between Jurong East and Outram Park. Work on the line should be completed by early 2017. In a press release by SMRT on Friday, it said that its engineering staff will be able to replace about 25 per cent more sleepers every night with the additional 30 minutes to work on the tracks. "New sleepers will give commuters a smoother and safer journey on our East-West Line trains," it said. "SMRT seeks the support, patience and understanding of commuters during this time." About 96,000 timber sleepers have been replaced with concrete sleepers on the North-South Line.